This one-story, front-gable-roof Craftsman bungalow has exposed rafter ends, knee braces, and a deck added at the northeast corner, German siding, and an attached, hip-roof front porch with exposed rafter ends, battered posts on brick piers, and no balustrade. There are two interior brick chimneys, and one exterior end brick chimney with a single shoulder. Windows are one-over-one replacement sash with snap-in muntins, and the front door is modern. 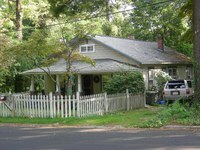 House sits on a small level lot with a modern picket fence in front. This house, according to the current owner, was originally a summer home for a Charleston family named Stone. City directories note, however, that the house was owned by Paul R. McCutcheon, beginning in 1937, who lived part of the year in Hendersonville and part of the year in St. Petersburg, Florida. McCutcheon owned the house until at least the late 1950s. Sanborn maps; city directories; owner information). 1034 Highland Avenue. Carport . Non-contributing. Modern. Modern free-standing carport with a front-gable metal roof, exposed beams and rafters, and tree trunk posts.